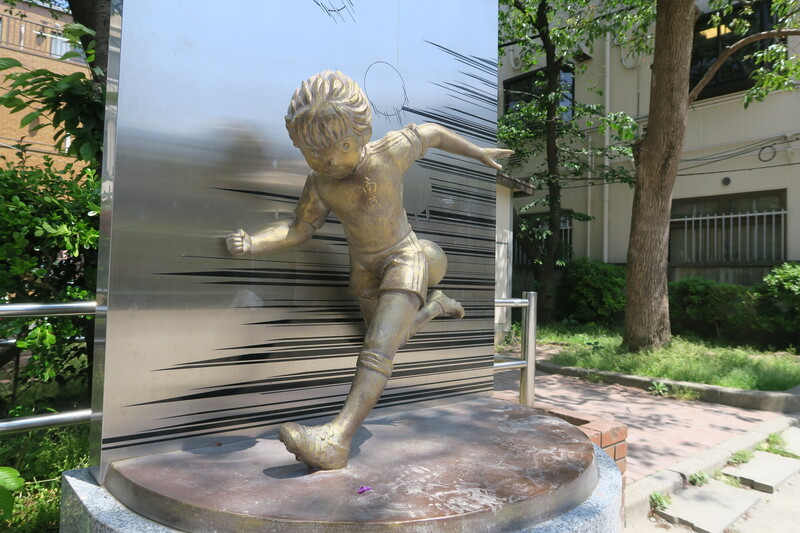 Captain Tsubasa is a manga (1981) from which several anime series have been created. The first one was released in 1983, but many others have been made over the years. The anime has been a huge success all over the world. 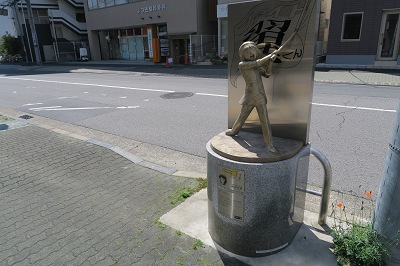 The author is Yōichi Takahashi and he was born in 1960 in Tokyo, in the ward of Katsushika. 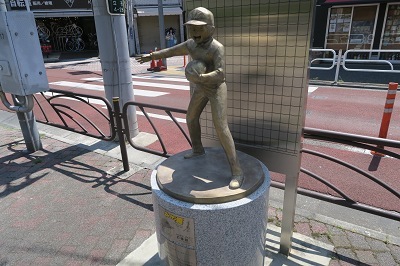 In particular, he was born and raised in the area around Yotsugi station, and graduated from a high school in the nearby neighborhood of Tateishi. 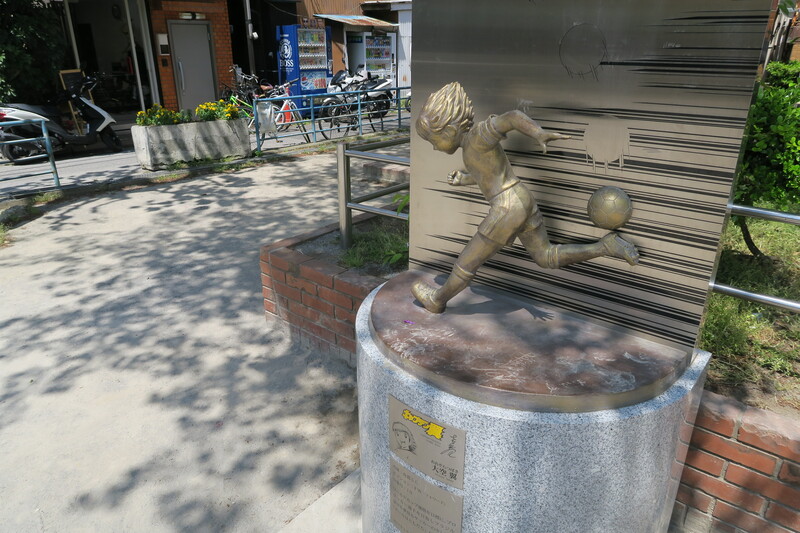 In 2013, eight statues depicting several famous characters from Captain Tsubasa were unveiled in the area between the stations of Yotsugi and Keisei-Tateishi, a quiet and quaint residential district of Tokyo. 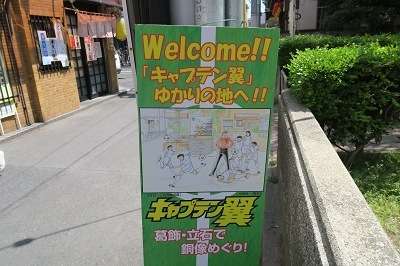 The author wanted in this way also to try to lend a hand to his hometown. 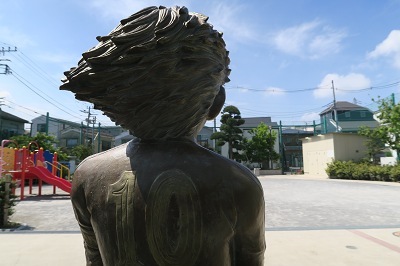 "Yotsugi is the place where I was born and raised, but it seems to be shabby compared to when I was a child. 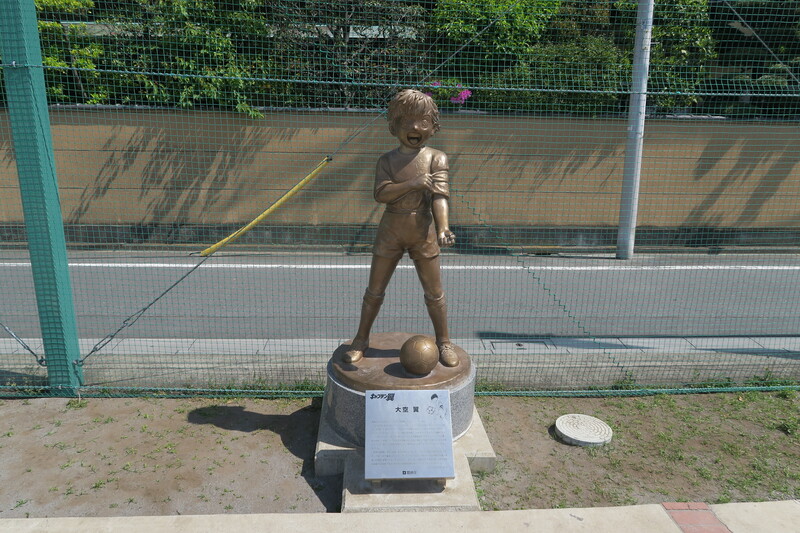 I would like every kind of people to come from all of Japan and from all over the world to see, touch and photograph this statue". 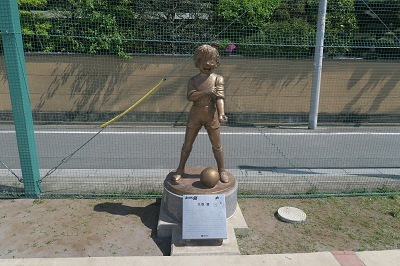 In this way Yōichi Takahashi commented on the inauguration of the first statue. Around the neighborhood you can find various references to Captain Tsubasa as well as maps (only in Japanese) with the location of the statues. Let's have a deeper look of each statue. Address: 4-15-10 Yotsugi, Katsushika, Tokyo (東京都葛飾区四つ木4-15-10). 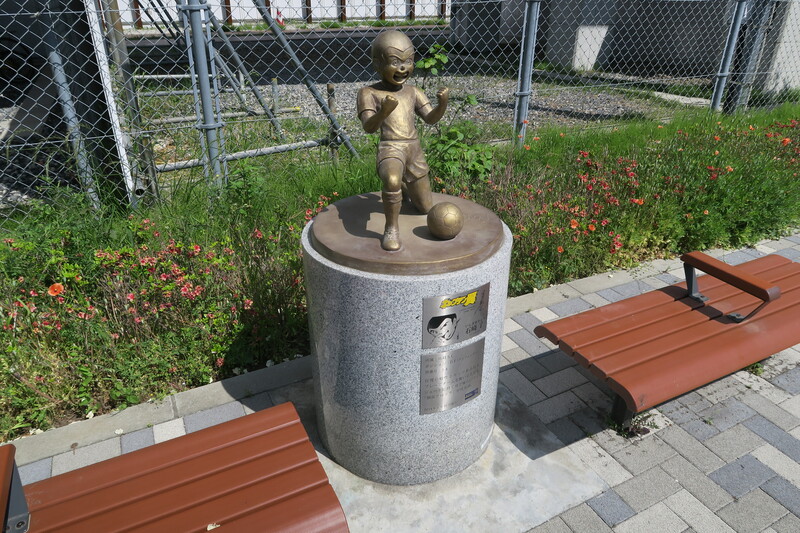 This statue is located under the elevated railroad tracks, in the immediate vicinity of Yotsugi station, only 90 meters away. It depicts Ryo Ishizaki, often known as Bruce Harper in several foreign dubbings: one of Tsubasa's best friends and a bit clumsy as a player, even if he has great willpower. 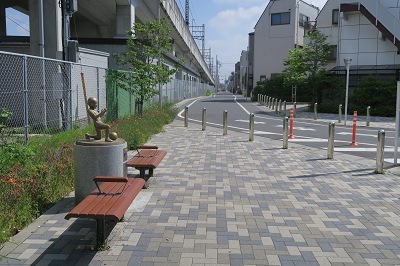 Address: 1-16-24 Yotsugi, Katsushika, Tokyo (東京都葛飾区四つ木1-16-24). 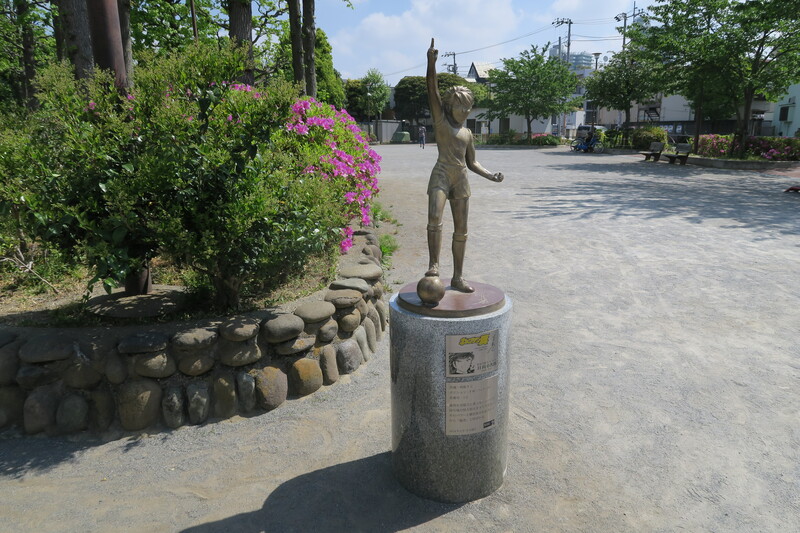 This statue is located within a small park (Yotsugi Park) 200 meters away from Yotsugi station, entirely surrounded by a quiet residential area. 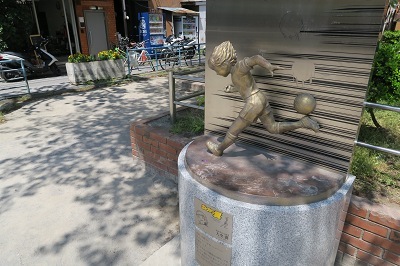 It depicts Kojiro Hyuga, often known as Mark Lenders or Steve Hyūga in several foreign dubbings: one of the strongest players in the series and the only one to have defeated Tsubasa at least once. He is famous for his shooting power and his very physical playing style. Address: 1-22-3 Yotsugi, Katsushika, Tokyo (東京都葛飾区四つ木1-22-3). 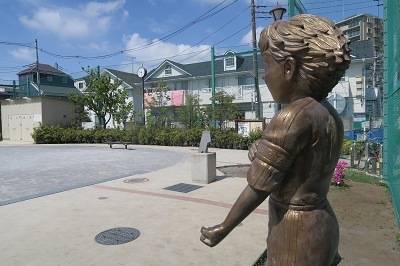 This statue is located within a children's playground renamed Yotsugi Tsubasa Park, 250 meters away from Yotsugi station. This is the first statue to have been made, and one of the only two ones to be life-size. 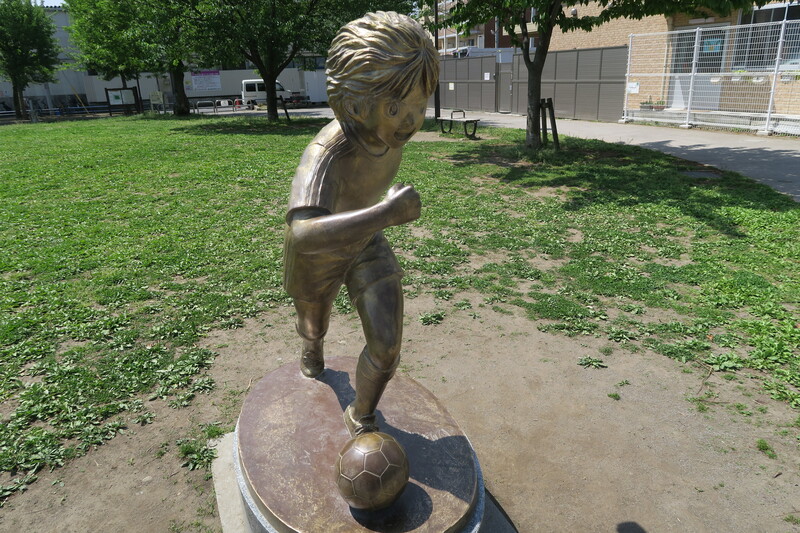 It depicts Tsubasa Oozora, often known as Oliver Hutton (Oliver Atton, Oliver Atom) in several foreign dubbings. The undisputed protagonist of the series. Address: 2-3-3 Yotsugi, Katsushika, Tokyo (東京都葛飾区四つ木2-3-3). 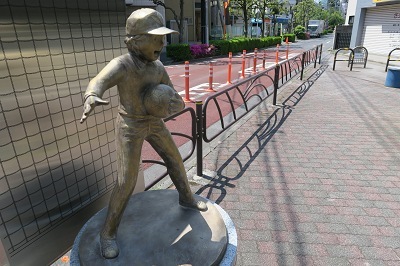 This statue stands on a sidewalk next to a large road about 500 meters north of Yotsugi station. 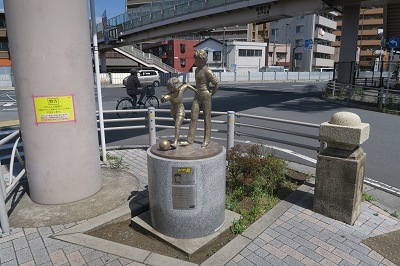 It is the only one depicting two characters: the main protagonist Tsubasa Oozora (Oliver Hutton) together with Roberto Hongo (Roberto Sedinho in some foreign dubbings), ex-Brazilian footballer, Tsubasa's great friend and life coach. 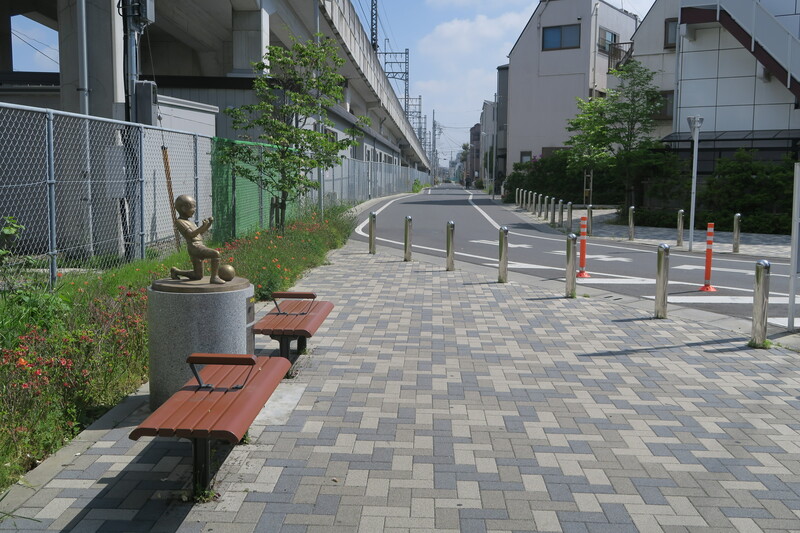 Address: 2-28-1 Yotsugi, Katsushika, Tokyo (四つ木2-28-1). 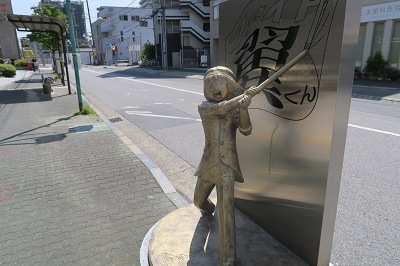 This statue stands on a sidewalk in front of the Katsushika Post Office, 600 meters away from Yotsugi station. 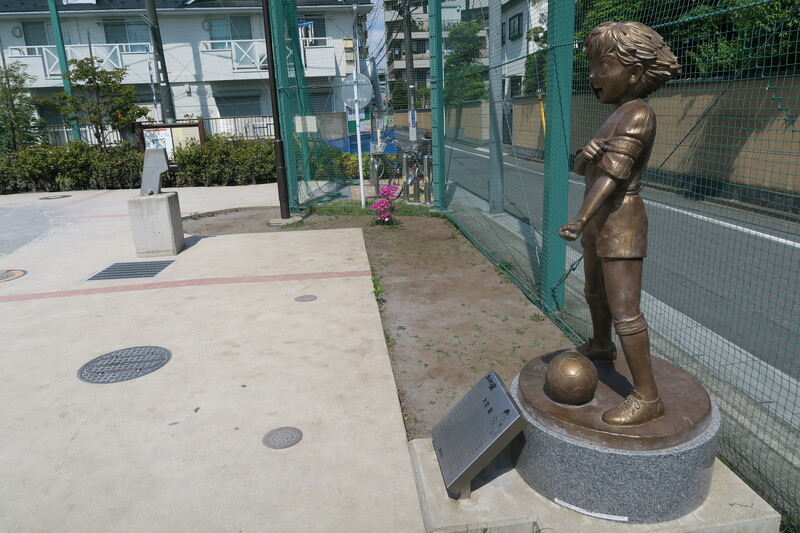 It depicts Sanae Nakazawa, often known as Patty in several foreign dubbings, waving a flag as she usually does during every game of Tsubasa's soccer team. A huge fan and madly in love with him, in the course of the series she will become the girlfriend of the protagonist. 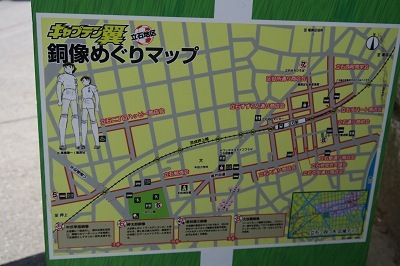 Address: 3-3-1 Tateishi, Katsushika, Tokyo (東京都葛飾区立石3-3-1). This statue is located within a small park (Shibue Park) more or less halfway between Yotsugi station and Keisei-Tateishi station. It is one of the only two life-size statues, along with that of Tsubasa previously mentioned. 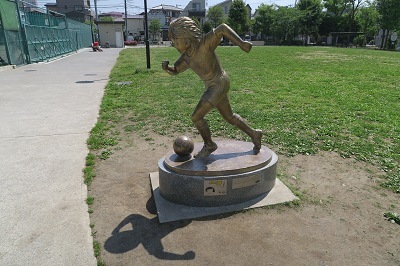 It depicts Taro Misaki running with the ball. 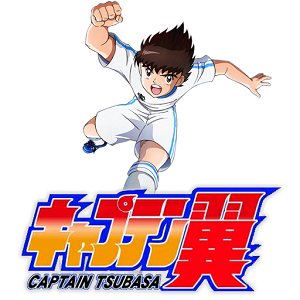 Often known as Tom Becker (Tom Baker, Ben Becker) in several foreign dubbings, he is a player with great technique, one of Tsubasa's best friends. Address: 4-28-14 Tateishi, Katsushika, Tokyo (東京都葛飾区立石4-28-14). This statue stands on a sidewalk about 200 meters north of Keisei-Tateishi station. It depicts Genzo Wakabayashi, often known as Benji Price (Tom Price in France), unbeatable goalkeeper and one of the main characters in the series. Address: 1-21-6 Tateishi, Katsushika, Tokyo. This statue is located inside a small playground (Tateishi 1 Children’s Park) in one of the characteristic commercial streets that surround Keisei-Tateishi station. 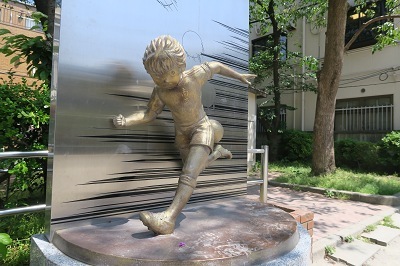 It depicts once again the protagonist of the series Tsubasa Oozora, running and lifting the ball with the heel. One of the many spectacular acrobatics that Tsubasa usually does during games. A few meters from Keisei-Tateishi station there is a restaurant called Trattoria Avere (トラットリア アヴェーレ), a favorite of the author of Captain Tsubasa, Yōichi Takahashi. It is a small Italian restaurant that serves pizza, pasta and other small dishes. 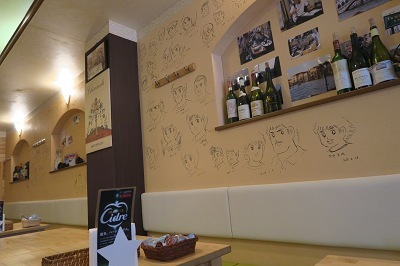 This restaurant has become popular among the Japanese fans of Captain Tsubasa because Tahahashi himself has gradually filled the interior walls with drawings of various characters of the series. The restaurant does not have a website, but it has a facebook page. About 700 meters north of Tateishi station there is the high school where Yōichi Takahashi graduated in 1978, the Tokyo Metropolitan Minami Katsushika High School (東京都立南葛飾高等学校). Katsushika is one of the 23 special wards of Tokyo, and it is located at the eastern end of the city. 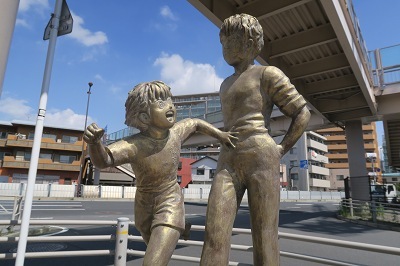 The two main stations to reach this area of Tokyo are Yotsugi station and Keisei-Tateishi station, located one after the other along the Keisei Oshiage line. The Keisei Oshiage line is a very short line itself, but you can reach the stations mentioned above very easily from Asakusa: the trains of the Toei Asakusa line of the subway, after reaching the terminus (Oshiage station) they continue along the Keisei Oshiage line, you don't need to change the train. The two stations are about 1.5 km from each other. 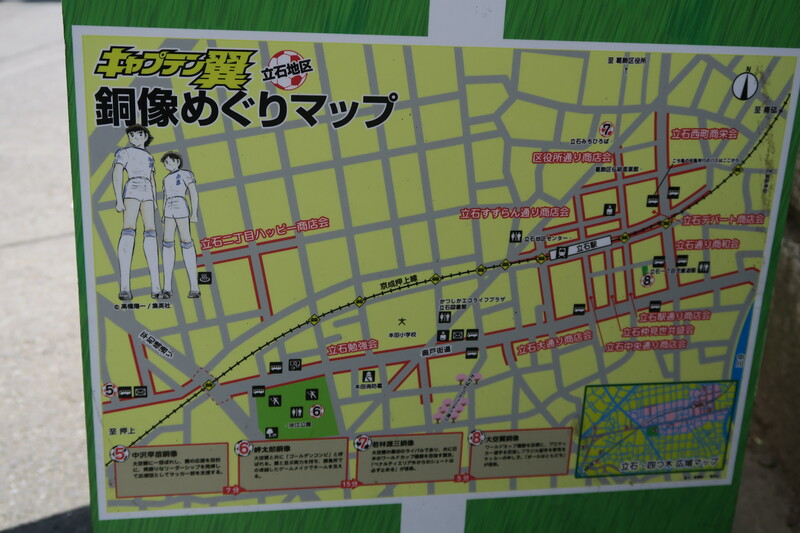 As you can see yourself from the map below, four statues of Captain Tsubasa out of eight are located near Yotsugi station, two are more or less halfway, two others are located near Keisei-Tateishi station, as well as the Trattoria Avere and the high school where Takahashi graduated. I advise you to get off at Yotsugi station, and from there to take a long walk through the streets of the surrounding residential district, looking for all the statues while getting closer and closer to the area of Tateishi. 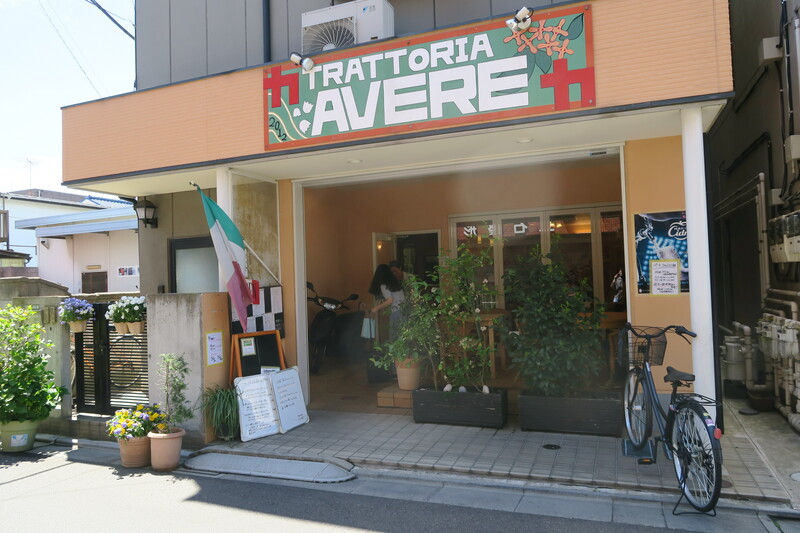 Tateishi is a very lively and quaint area, full of shops and restaurants (including the above-mentioned Trattoria Avere), so it is a great place to end your walk eating something in an area frequented only by locals.